A green field with the large yellow diamond (rhombus) in the center bearing the blue disk, which is formed the celestial globe, depicted the starry sky of twenty-seven small white five-pointed stars spanned by the white equatorial curved band with the National Motto: "ORDEM E PROGRESSO" (Portuguese for "ORDER AND PROGRESS"), written in green. The flag of Brazil (Portuguese: Bandeira do Brasil), known in Portuguese as Verde e amarela ("The Green and Yellow"), or less usually Auriverde ("The Gold-Green"), is a blue disc depicting a starry sky (which includes the Southern Cross) spanned by a curved band inscribed with the national motto "Ordem e Progresso" ("Order and Progress"), within a yellow rhombus, on a green field. Brazil officially adopted this design for its national flag on November 19, 1889 — four days after the Proclamation of the Republic, to replace the flag of the Empire of Brazil. The concept was the work of Raimundo Teixeira Mendes, with the collaboration of Miguel Lemos, Manuel Pereira Reis and Décio Villares. The green field and the yellow rhombus from the previous imperial flag, though slightly modified in hue and shape, were preserved — the green represented the House of Braganza of Pedro I, the first Emperor of Brazil, while the yellow represented the House of Habsburg of his wife, Empress Maria Leopoldina. A blue circle with white five-pointed stars replaced the arms of the Empire of Brazil — its position in the flag reflects the sky over the city of Rio de Janeiro on November 15, 1889. The motto Ordem e Progresso is inspired by Auguste Comte's motto of positivism: "L'amour pour principe et l'ordre pour base; le progrès pour but" ("Love as a principle and order as the basis; progress as the goal"). Each star corresponds to a Brazilian Federative Unit and, according to Brazilian Law, the flag must be updated in case of creation or extinction of a state. At the time the flag was first adopted in 1889, it held 21 stars. Then it received one more star in 1960 (representing the city-state of Guanabara), then another in 1968 (representing Acre), and finally four more stars in 1992 (representing Amapá, Roraima, Rondônia and Tocantins), totalling 27 stars in its current version. The Portuguese territories in the Americas, corresponding roughly to what is now Brazil, never had their own official flag, since Portuguese tradition encouraged hoisting the flag of the Kingdom of Portugal in all territories of the Portuguese Crown. The first Brazilian vexillological symbols were private maritime flags used by Portuguese merchant ships that sailed to Brazil. A flag with green and white stripes was used until 1692. The green and white colors represented the House of Braganza and the national colours of Portugal. In 1692, that flag was no longer used by ships that sailed to Brazil and became the flag of the merchant vessels in coastal Portugal. In 1692, a new flag was introduced for merchant vessels sailing to Brazil. The new flag had a white field with a golden armillary sphere. The armillary sphere had served as the personal emblem of King Manuel I of Portugal (reigned 1494-1521). During his reign Portuguese ships used it widely, and eventually it became a national emblem of Portugal and, more specifically, of the Portuguese empire. A similar flag was introduced[by whom?] for the Portuguese ships that sailed to India, but with a red armillary sphere. Despite representing the entire Portuguese empire, the armillary sphere began to be used more extensively in Brazil — the largest and most developed colony at the time — not only in maritime flags, but also on coins and other media. It eventually became the unofficial ensign of Brazil. In 1815, Brazil was elevated to the rank of kingdom, and the kingdoms of Portugal, Brazil and the Algarves were united as a single state--the United Kingdom of Portugal, Brazil and the Algarves. The Charter Act of 1816 established the insignia of the new kingdom. It specified that the arms of the Kingdom of Brazil was to be composed of a gold armillary sphere on a blue field. During this time, the flag of Brazil was the flag of the United Kingdom of Portugal, Brazil, and the Algarves. The imperial flag of Brazil was designed by Jean-Baptiste Debret as the Royal Standard of the Prince Royal of the United Kingdom of Portugal, Brazil and the Algarves, Pedro I. After the Brazilian Declaration of Independence, and with the coronation of Pedro I as Emperor of Brazil, the Royal Standard was modified to become the flag of the Empire of Brazil. The new flag featured the imperial coat of arms within a yellow rhombus, on a green field. The green and yellow colors represented the dynastic houses of Pedro I and his consort Maria Leopoldina of Austria. The imperial flag was slightly modified during the reign of Pedro II, when an extra star was added to the imperial arms to conform to the new territorial organization of the country. Upon the proclamation of the Republic, one of the civilian leaders of the movement, the lawyer Ruy Barbosa, proposed a design for the nation's new flag strongly inspired by the flag of the United States. It was flown from 15 November 1889, until 19 November 1889, when Marshal Deodoro da Fonseca (acting as provisional president of Brazil) vetoed the design, citing concerns that it looked too similar to the flag of another state. Fonseca suggested that the flag of the new republic should resemble the old imperial flag. This was intended to underscore continuity of national unity during the transition from a constitutional monarchy to a republic. Raimundo Teixeira Mendes presented a project in which the imperial coat of arms was replaced by a blue celestial globe and the positivist motto. It was presented to Fonseca, who promptly accepted. The flag was designed by a group formed by Raimundo Teixeira Mendes, Miguel Lemos, Manuel Pereira Reis and Décio Villares. It was officially adopted on 19 November 1889. The flag has been modified on three occasions to add additional stars intended to reflect newly created states: 1960 (22 stars), 1968 (23 stars) and 1992 (27 stars). In contrast to many other national flags with elements representing political subdivisions, modifications to the flag of Brazil were not always made promptly upon political reorganisation, resulting in multi-year periods of history where there was a mismatch between the number of stars and the number of states and federal districts. The most recent modification was made on 11 May 1992, with the addition of four stars to the celestial globe (representing states created between 1982 and 1991), and a slight change in the stars' positions was made to match the astronomical coordinates correctly. The decree no. 4, issued on 19 November 1889, legally replaced the flag used under the constitutional monarchy with the new national flag. On 11 May 1992, the law no. 8,421, altered the celestial globe with the addition of six stars. 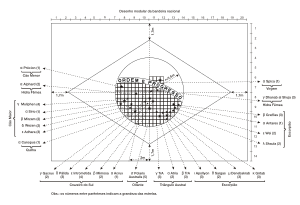 Construction sheet with the official dimensions of the flag. The precise positions of the 27 stars on the globe make the Brazilian flag one of the most complicated national flags to construct. The official design is defined by law no. 5,700, issued on 1 September 1971. The flag's length is twenty modules and the width, fourteen, translating into an aspect ratio of 10:7. The distance of the vertices of the yellow rhombus to the outer frame is a module and seven-tenths (1.7m). The blue circle in the middle of the yellow rhombus has a radius of three and a half modules (3.5m). The center of the arcs of the white band is two modules (2m) to the left of the meeting point of the extended vertical diameter of the circle with the base of the outer frame. The radius of the lower arc of the white band is eight modules (8m) and the radius of the upper arc of the white band is eight and a half modules (8.5m). The width of the white band is a half of a module (0.5m). The caption "Ordem e Progresso" is written in green letters. The letter P lies on the vertical diameter of the circle. The letters of the word "Ordem" and the word "Progresso" are a third of a module (0.33m) tall. The width of these letters are three-tenths of a module (0.30m). The conjunction E has a height of three-tenths of a module (0.30m) and a width of a quarter of a module (0.25m). The stars are of five different sizes: first, second, third, fourth and fifth magnitudes. They are drawn within circles whose diameters are: three-tenths of a module (0.30m) for the first magnitude, a quarter of a module (0.25 m) for the second magnitude; a fifth of a module (0.20m) for the third magnitude, a seventh of a module (0.14m) for the fourth magnitude, and a tenth of a module (0.10m) for the fifth magnitude. 1. Procyon (α Canis Minoris). 2. Canis Major: five stars, the largest depicting Sirius. 5. Hydra: two stars, the largest depicting Alphard. 6. Crux Australis: five stars, the largest depicting Alpha Crucis. 7. Sigma Octantis (σ Octantis, south pole star). 8. Triangulum Australe: three stars of similar size. 9. Scorpius: eight stars, the largest depicting Antares. Paulo Araújo Duarte of the Federal University of Santa Catarina claims that "the creators of our republican flag intended to represent the stars in the sky at Rio de Janeiro at 8:30 in the morning on 15 November 1889, the moment at which the constellation of the Southern Cross was on the meridian of Rio de Janeiro and the longer arm [of the cross] was vertical". Another article, citing "O Céu da Bandeira (The Sky of the Flag)", by J. R. V. Costa, says the exact time was actually 08:37. This last article includes the flag's designer's explanation of his intentions regarding the stars. According to Brazil's national act number 5,700 of 1 September 1971, the flag portrays the stars as they would be seen by an imaginary observer an infinite distance above Rio de Janeiro standing outside the firmament in which the stars are meant to be placed (i.e. as found on a celestial globe). Thus Beta Crucis appears to the right of the constellation and Delta Crucis to the left, in mirror image of the way they actually appear in the sky (and, coincidentally, the way they appear on the Brazilian coat of arms). The star Spica is the only one above of the white band; it symbolises part of Brazilian territory in the northern hemisphere (and the State of Pará). The Sigma Octantis (south pole star) is small, but all the other stars turn around it. Its unique position in the sky of south hemisphere represents the stability of the Federal District in the Brazilian union. The shining star in constellation represent the size of territory of the state in the Brazilian region (constellation). The flag of Brazil contains 27 stars, representing the Brazilian states and the Federal District. The constellation of the Southern Cross is on the meridian (indicated by the number 6 in the diagram). To the south of it is Polaris Australis (Sigma Octantis, numbered 7), representing the Federal District. The motto appears on a band roughly coincident with the ecliptic. A single star lies above the band, representing the large northern state of Pará, which straddles the equator. ^ Brazil's original Federal District was created in 1889 from the former Neutral Municipality covering the then-capital city of Rio de Janeiro, and represented on the flag by the star Sigma Octantis (Polaris Australis). In 1960, to correspond with the creation of the new capital, Brasília, the Federal District was reconstituted on new territory carved out of the state of Goiás, in border with the Minas Gerais state; it continued to be represented on by the flag by Sigma Octantis. The former Federal District became the new state of Guanabara and a new star, Alphard, was added to the flag to represent it. Guanabara was eliminated as a separate state in 1975; however, Alphard was not removed from the flag and from 1975 to 1979 it represented no state. When the new state of Mato Grosso do Sul was created in 1979, it was assigned Alphard. The federal law no. 5,700, issued on 1 September 1971, defines the flag protocol in Brazil. The flag must be permanently hoisted at the Praça dos Três Poderes in Brasília. The flag must be raised and lowered daily at the presidential palaces (Palácio do Planalto and Palácio da Alvorada); ministries; National Congress; Supreme Federal Tribunal; Supreme Court of Justice; seats of the Executive, Legislative and Judicial branches; diplomatic missions; Federal, state and local institutions; and merchant navy units. When a flag is no longer fit to use, it must be delivered to a military facility to be burned during a special ceremony on 19 November ("Flag Day"). The flag must be flown at half-staff when the President decrees official mourning. In addition, state and local governments may decree official mourning with the death of a mayor or governor. When the flag is displayed at half-staff, prior to raising or lowering it, the flag must be raised to the top of the flagpole and then lowered to the halfway mark. When the flag is being carried in procession, a black crape ribbon must be tied to the top of the mast. A foreign flag may only be flown with a Brazilian Flag along its right side. The only exceptions are when the foreign flag is displayed in an embassy or consulate and in prize-giving ceremonies of sport competitions won by foreign athletes. 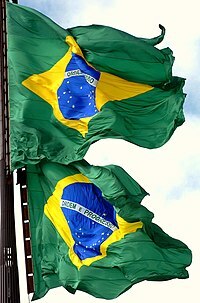 When multiple flags are raised or lowered simultaneously, the Brazilian Flag must be the first to reach the top of the flagpole and the last to reach the bottom. The upper half of the flag's height is folded into the reverse side. The folding proceeds by folding the flag's lower half into the reverse side until most of the blue disc and the motto face up. The flag is then folded into three parts along the width axis, with the fly and hoist folded into the reverse side, leaving the blue disc and motto facing up. Brazilian Flag Anthem performed by the Brazilian Army choir. The Brazilian Flag Anthem (Hino à Bandeira Nacional) is a song dedicated to the country's flag. It is performed on 19 November (Flag Day). The Portuguese lyrics were written by poet Olavo Bilac, and the music composed by Francisco Braga. 1. Salve, lindo pendão da esperança! (Chorus) 1. Hail, precious banner of hope! Hail, August symbol of peace! The greatness of our motherland does bring. Of the beloved land of Brazil! And the splendor of the Southern Cross. Powerful and happy shall be! Pavilion of justice and love! The president and vice president are also represented by their own flag. The Presidential Standard is a dark green rectangle (ratio 2:3) holding the national coat of arms on its center. It is usually hoisted at the President's official residence, the Palácio da Alvorada, and at the President's workplace, the Palácio do Planalto. It is also displayed on the presidential car, as small-sized flags. The Vice Presidential Standard is a yellow rectangle (ratio 2:3) with twenty-three blue stars disposed in a cross dividing the flag into four equal quadrants, with the coat of arms in the middle of the upper left quadrant. Some of the branches of the Brazilian military also have their own flags. Flag-insignia of the chief of the Joint Chiefs of Staff of the Brazilian Armed Forces. The Brazilian naval jack (jaque) is a rectangular flag (ratio 3:4) bearing 21 white stars on a dark blue field – a horizontal row of 13 and a vertical column of 9, orthogonally displayed. The list below identifies previous flags used in Brazil. The best-known rejected flags are listed below. Several projects were heavily inspired by the green-yellow Imperial Flag, while a black-white-red pattern was also proposed. Those colours would represent the major groups of Brazilian population, red being the native Indians, white the European settlers and immigrants and black the Africans. ^ This flag was never actually used, its design being deducted from the flag of the United Kingdom of Portugal, Brazil and the Algarves. ^ The World Factbook: Brazil – Flag description CIA. Retrieved on 8 October 2010. ^ a b Bandeiras e significados Historianet. Retrieved on 9 October 2010. (in Portuguese). ^ Bandeiras navais Portuguesas Archived 2010-11-27 at the Wayback Machine Associação Nacional de Cruzeiros. Retrieved on 9 October 2010. (in Portuguese). ^ a b Carta de Lei de 13 de Maio de 1816 John Carter Brown Library. Retrieved on 9 October 2010. ^ Decreto de D. Pedro I de 18 de setembro de 1822 Wikisource. Retrieved on 9 October 2010. (in Portuguese). ^ a b c Um estudo histórico perceptual: A Bandeira Brasileira sem Brasil Archived 2011-07-26 at the Wayback Machine Seysell, Ricardo. Universidade Estadual Paulista), 2006. Retrieved on 10 October 2010. (in Portuguese). ^ Designers of the Flag Flags of the World. Retrieved on 8 October 2010. ^ Símbolos Nacionais Archived 2010-08-19 at the Wayback Machine Exército Brasileiro. Retrieved on 8 October 2010. (in Portuguese). ^ a b Brazil: Evolution of the Modern National Flag Flags of the World. Retrieved on 11 July 2015. ^ a b Símbolos e Hinos: Bandeira Nacional Archived May 19, 2011, at the Wayback Machine Brasil.gov.br. Retrieved on 9 October 2010. (in Portuguese). ^ Law on the National Flag: details of construction Flags of the World. Retrieved on 8 October 2010. ^ a b c Duarte, Paulo Araújo. "Astronomia na Bandeira Brasileira". Universidade Federal de Santa Catarina. Archived from the original on 2 May 2008. Retrieved 9 July 2009. ^ a b c "Naming Stars". IAU.org. Retrieved 16 December 2017. ^ "Brazilian flag". Archived from the original on 2014-07-06. ^ Uso da Bandeira Nacional Brasil República. Retrieved on 15 June 2009. (in Portuguese). ^ Lei no. 5,700 de 1 de Setembro de 1971 Presidência da República. Retrieved on 9 October 2010. (in Portuguese). ^ Hino à Bandeira Nacional – Coral (Exército Brasileiro) Dominiopublico.gov.br. Retrieved on 2010-10-10. (in Portuguese). ^ a b Hino à Bandeira Nacional Archived 2014-02-22 at the Wayback Machine Exército Brasileiro. Retrieved on 10 October 2010. (in Portuguese). ^ President and Vice President (Brazil) Flags of the World. Retrieved on 9 October 2010. ^ "Bandeiras Históricas do Brasil". Exército Brasileiro (in Portuguese). Archived from the original on 2007-12-14. ^ Projetos de mudança da Bandeira Nacional Brasileira BrasilRepública. Retrieved on 2010-10-08. (in Portuguese).